Acoustic UAV guidance is an enabling technology for future urban UAV transportation systems. When large numbers of commercial UAVs are tasked to deliver goods and services in a metropolitan area, they need to be guided to travel orderly along aerial corridors above streets. They will need to land or take off from designated parking structure and obey “traffic signals” to mitigate potential collisions. An UAV acoustic guidance system consists of a group of ground stations distributed over the operating region. When the UAV is entering the system, the UAV’s fly path will be under the guidance of a regional air-traffic controller system. The UAV and the controller will communicate via radio channel using wifi or 5G cellular network internet of things protocols. The UAV’s position will be estimated through estimation of the DoA angles of narrow band acoustic signals. As shown in Figure 1, acoustic UAV guidance can operate in a passive self-guidance mode as well as an active guidance mode. In the passive self-guidance mode, beacons with known 3D positions will emit known, distinct narrow-band (harmonic) signals. A UAV will passively receive acoustic signals using an on-board microphone phase array. It will use the acoustic signals so sampled to estimate the direction-of-arrival (DoA) of each beacon harmonic signal. If the UAV is provided with the beacon stations’ 3D coordinates, the UAV will be able to determine its own locations and heading complement those estimated using GPS or inertial guidance systems. The advantage of the passive guidance system is that multiple UAVs can use the same group of beacon stations to estimate their own position. The technical challenge is that each UAV will be mounted with a bulky acoustic phase array; and the received acoustic signal will suffer from strong noise interference due to engine, propeller/rotor, and wind. Conversely, in an active guidance mode, the UAV will actively emit an omni-directionally transmitted, narrow-band acoustic signal using a harmonic frequency designated by the local air-traffic controller. Each beacon station will use its local acoustic micro-phone phase array to estimate the DoA of the UAV acoustic signal. The UAV’s location, speed, and heading then will be estimated by the local air-traffic controller and transmitted to the UAV. The advantage of the active guidance mode is that the UAV has a lighter payload which consists of an amplified speaker and related circuitry. The disadvantage of this approach is that each UAV within the region needs to be able to generate harmonic signals with a distinct center frequency. As the number of UAVs within the region increases, available acoustic frequencies may be insufficient. In this paper, we investigate key issues relating to the design and implementation of a passive mode acoustic guidance system. We ask fundamental questions such as what is the effective range of applying acoustic guidance? What are sizes and configurations of the on-board phase array? What is an efficient formulation of a direction of arrival estimation algorithm so that it can be implemented on the computers on-board a UAV? We conducted on-the-ground experiment and found the sound attenuation as a function of distance and harmonic frequency. The result is shown in Figure 2 below. Using a commercial UAV (DJI Phantom model), we conduct experiments to study the frequency spectrum of sound at different motion states to identify beacon frequencies that may be least interfered by engine sound and noise. 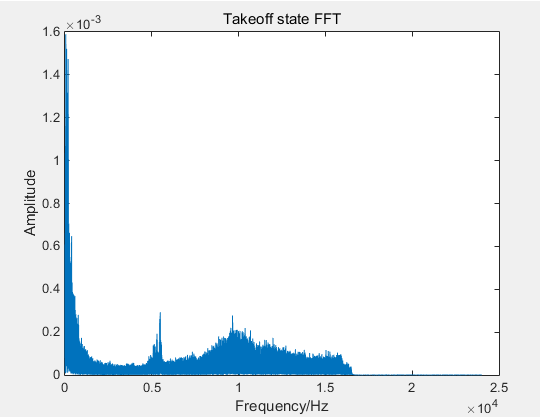 An example of the acoustic spectrum during taking off is shown in Figure 3 below. We also developed a simplified direction of arrival estimation algorithm that achieves encouraging accuracy while implemented using a STM32F407 micro-controller that can easily be installed on a UAV.